Current position: Senior Partner and Head of Department (Trademarks, Contractual and Commercial IP, Entertainment and Contractual IP). Practice area/industry focus: His practice areas include Trademarks, Contractual and Commercial IP, Entertainment and Contractual IP ,franchising and licensing, character merchandising, advertising and labelling laws, IP audits, IP issues in mergers and acquisitions and due diligence. Career highlights: Mr. Safir Anand advises numerous Fortune 500 companies and acts for clients from diverse industries and sectors. 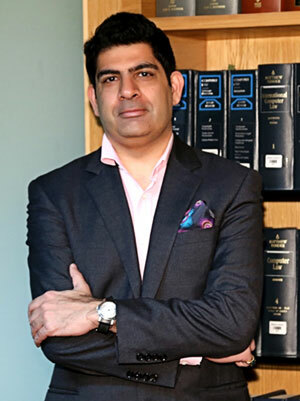 He is a member of the Bar Council of India, INTA, APAA, Asia-Pacific Lawyers Association, SAARCLAW, AIPPI, International Bar Association, LIMA India Advisory Committee, Luxury Society, The Association of Media and Entertainment Counsel, The International Franchising Association and Centre for International Legal Studies. Also, He is on the board of directors of IFMA and has been re-elected as a part of Marques brand and Marketing Team. Also, he is a part of the Andhra Pradesh Govt Task force, Dept of Information Technology, Electronics and Communications Dept to work on setting up India’s first CYBER school. The Govt of Israel is also a part of this prestigious assignment. Mr. Anand has spoken extensively at various conferences including Franchise India on the subject of Lawyers in the role of Business Strategist, The Lexis Nexis conference on Importance of IP in Mergers and Acquisitions; The ACMA conference on IP Management through Brand Protection and the Brand Licensing conference on Negotiating a License Agreement.